Sometimes I wake up at night and wonder what time it is. In the summer if it is starting to get light it is most likely around 4am. However, in the winter it is dark for nearly twelve hours. Of course I could look out of the window if the night is clear and see where Orion is in the sky, if the constellation is setting in the west then it is nearly morning. In the Tudor period ships started to take longer voyages across oceans and sailors needed better methods to accurately determine the time during the night to help them navigate in the days before GPS! One solution was to have a cabin boy sit with a hour glass at night which he would turn over whenever it emptied and log the passing hours. Another method was lighting a marked candle which took a fixed time to burn down. However neither method was very accurate and both were subject to variances, the cabin boy might fall asleep and the candle could be exposed to a draft which would cause it to burn more quickly. A better solution for sailors in the Northern Hemisphere was to use a Nocturnal which became popular in the 16th century. The concept of the Nocturnal dates back to Lull in the 12th century but the devices only became popular much later. Peter Apianus describes them in his 1530 text Cosmographicus Liber. I bought a small replica of Humphrey Cole's 1570 Nocturnal last weekend at the Oxford Museum of the History of Science. The original is in the British Museum. On Thursday there was a clear evening so I was able to test the Nocturnal. I set the outside dial to 22nd February. Aligned the centre hole with Polaris and then moved the pointer (Alidade) to point to Kochab, the brightest star in Ursa Minor. The result was very good. The Nocturnal alidade was halfway between 8 and 9 on the dial and my watch showed it was about 20:30. I think the full size instrument would have been accurate to about plus or minus 10 minutes and this would have been sufficient for night time navigation. Shakespeare does not mention Astrolabes or Nocturnals in his plays but he does mention depth sounding in many places which sailors used to navigate on short journey across the English Channel or around the European coast (See Henry IV Part 1, Act I, Scene III & Henry VIII Act III, Scene 2). Its possible that Shakespeare may have been on boat himself and travelled to Italy. There are plenty of accounts of seafaring in his plays notably in The Tempest and accounts of merchants making and sometimes losing their wealth by trading overseas (The Merchant of Venice and Othello). Possibly instruments like the astrolabe and nocturnal would have been kept locked away in the captain's quarters for safety and not seen by the sailors on deck. 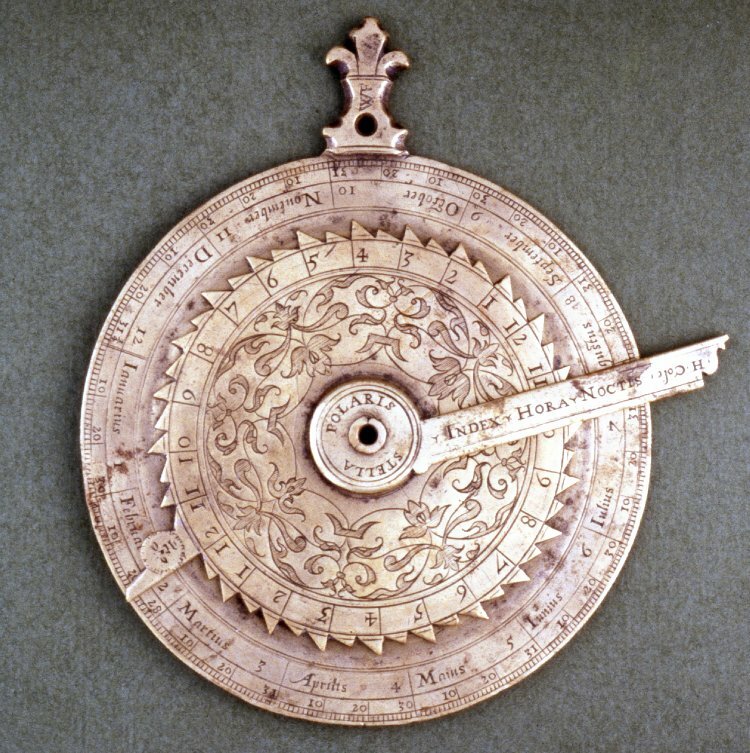 Shakespeare does use a lot of seafaring terms in his plays and sonnets but the fact he never refers to the Astrolabe or Nocturnal suggests they were not yet in common usage.